We’d love your help. Let us know what’s wrong with this preview of Nyx in the House of Night by P.C. Cast. The House of Night is no ordinary school—and not just because it's for vampyres. It's a place where magic, religion, folklore, and mythology from multiple traditions merry meet and meld to create something incredible and new. In Nyx in the House of Night—a 2-color illustrated companion to the House of Night series—some of your favorite YA authors, plus a few experts, help y The House of Night is no ordinary school—and not just because it's for vampyres. It's a place where magic, religion, folklore, and mythology from multiple traditions merry meet and meld to create something incredible and new. In Nyx in the House of Night—a 2-color illustrated companion to the House of Night series—some of your favorite YA authors, plus a few experts, help you navigate the influences behind the House of Night series in a guide that would get even Damien's seal of approval. To ask other readers questions about Nyx in the House of Night, please sign up. I love this book,it's not like Twilight like everyone says it is, it's way better than that. The last book is coming out in Janurary and I can't wait to read it. omg. i absolutely love this series. i am previously am reading the 6th book "Tempted" for the house of night series. Don't be confused. This is not A House of night novel. This is an non fiction book about the goddes Nyx and another mithological stuff used in the series, write in essay way by a few authors (kristin cast included and edited by P. C.Cast). If you are interested in the real base of the myths used in the series or history, and religion, and things that influence the autors, maybe this book is for you. If your not, please make you a favor and pass out, because it'll be boring for you. Let me be clear Don't be confused. This is not A House of night novel. This is an non fiction book about the goddes Nyx and another mithological stuff used in the series, write in essay way by a few authors (kristin cast included and edited by P. C.Cast). Let me be clear: some authors opinions about the research and use of mithological and historial stuff in the HoN by Cast team was great (I really love the kristin's essay). But some of them... Make me want go to the bed. The first one: I loved. The comparation with the different deities all around the world give me a better compresion of what Cast team was really doing. This is a book to go along with the House of Night series and providing background information. Too often I have seen where such books are very shallow and are rather poorly done and totally uninteresting to someone who is not familiar with the series. This book, though, is not only well done but I think would interest someone who has not yet read the series and would probably encourage them to read it. There is one whole chapter on the marks and what they mean (and how marks have been used throu This is a book to go along with the House of Night series and providing background information. Too often I have seen where such books are very shallow and are rather poorly done and totally uninteresting to someone who is not familiar with the series. This book, though, is not only well done but I think would interest someone who has not yet read the series and would probably encourage them to read it. There is one whole chapter on the marks and what they mean (and how marks have been used through history), Cherokee spirituality, the Divine Cat. Goddess worship and ten more complete chapters on related topics. Not only is there all this but there is also a glossary that includes information on various characters, gods, animals and the Vampire High Council. This is a hard book to rate. If you are looking for stories from different authors using the characters, as I thought this book was when I first started it, then the reader will be disappointed. Instead this book, goes into the the history of the different characters, using history, myths, mythology and religion, to explain the different people, places animals and religions in the stories by people very knowledgeable in the different area, then the reader will find this book to be a very helpful This is a hard book to rate. If you are looking for stories from different authors using the characters, as I thought this book was when I first started it, then the reader will be disappointed. Instead this book, goes into the the history of the different characters, using history, myths, mythology and religion, to explain the different people, places animals and religions in the stories by people very knowledgeable in the different area, then the reader will find this book to be a very helpful source of information. One part I found very interesting was when P.C. Cast described her studies of the different places and characters for the series. So is it a good story? No. 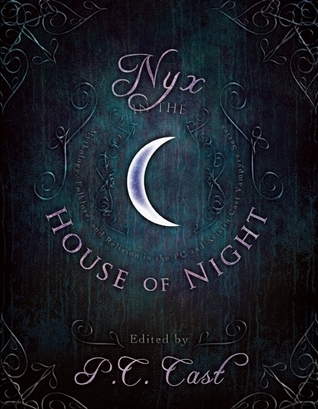 Nyx in the House of Night is companion book; it's a collection of essays about the Mythology, Folklore and Religion in the House of Night Series. The essays come from authors P.C. Cast, John Edgar Browning, Kristin Cast, Jordan Dane, Trinity Faegen, Yasmine Galenorn, Bryan Lankford, Karen Mahoney, Jana Oliver, Jeri Smith-Ready, Ellen Steiber, Amy H. Sturgis and Christine Zika. The book focuses on questions of lore, myths and religions that define the House of Night universe. 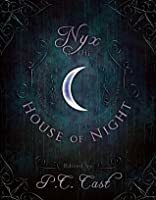 The subjects range fr Nyx in the House of Night is companion book; it's a collection of essays about the Mythology, Folklore and Religion in the House of Night Series. The essays come from authors P.C. Cast, John Edgar Browning, Kristin Cast, Jordan Dane, Trinity Faegen, Yasmine Galenorn, Bryan Lankford, Karen Mahoney, Jana Oliver, Jeri Smith-Ready, Ellen Steiber, Amy H. Sturgis and Christine Zika. The book focuses on questions of lore, myths and religions that define the House of Night universe. The subjects range from Greek Goddesses, myths, Cat Lore and facts, Historical explanations and Name Meanings of the House of Night cast. Recommends it for: Err. Im not sure..
To be honest, It was a good research book, and it was really thorough. I just felt like it was a little like a textbook. I felt like I should be taking notes, and then I should watch a really boring clip about this after. That or, watch some good old Bill Nye the Science Guy. Only about Vampyres. If that makes sense. I don't really know what else to say. I mean, hey. If you like to read textbooks for fun, be my guest. It's just I don't get what all the hype was about this book.. I don't even know what I was expecting, I just wasn't expecting what it actually was. So. Read it if you like, just don't blame me when you're falling asleep after the first couple pages! I basically bought this book to add to the collection of the series I own. I actually have not read it and will not. Its a companions book to the series and if you want to understand the religion behind the house of night vampires then you need to read this. I understand the series just fine. I scanned this book and it was good enough for me. so I have no real review but to say if you do not understand the religion as I said above then read this and you will understand the books a bit better. A very eclectic set of essays from a variety of authors (reseachers to YA authors of paranormal titles) who have focused on various elements in the House of Night series. I loved learned about all of the various cultures' mythologies and religions that have been weaved into the creation of the House of Night rituals, names, and inhabitants. A must read for anyone who is a House of Night aficionado. The art work that prefaces each essay is also quite stunning. Nyx in the House of Night: Mythology, Folklore and Religion in the PC and Kristin Cast Vampyre Series gives a new look into the creation of the House of Night. I really can't pick a favorite chapter - they were all very informative! From rituals to history, Tulsa to Scotland, and Cherokee legend to Greek myths, Nyx in the House of Night brings insight and knowledge into how the Casts bring the characters, settings, and magic to life. I'm so glad I read this! This books lends a new light to the whole HON series for me! I love that P.C and Kristin did the research they did to being the series to life! Even fictionalized, the real stories beyond them wonderous! My interest is definitely peaked in some areas that I plan on exploring more of! Connecting the world around me with what I learned from this book leaves me curious to know more to connect more dots! It wasn't what I thought in a good way. I liked learning the names, history, and facts from the celtic lore and types of vampires. I expected something different. I don't know what but just something else. I love the series and this book made a little more sense for me. And gave more more factual information into the discription and cultures within the series. Can't wait till the next book comes around. Este libro es bastante interesante porque se explican varias cosas de la serie la casa de la noche, desde el punto de vista de varias personas.. tambien dice como las autoras llegaron a inspirarse para escribir..y como hacen sus investigaciones y cambian ciertas tradiciones para adaptarlas todas a esta maravillosa serie.. tarde demasiado leyendo el libro por falta de tiempo :p.. y no porque fuera no fuera interesante.. I'm conflicted on this anthology because while the essays themselves are very well done and incredibly informative, I can't help but roll my eyes at all the praise given to a series that I don't feel lives up to the source material that is elaborated on here. It's a poorly written and often poorly executed series of books and all the big words and scholarly gushing doesn't change that for me. I had no idea that Cast did so much research. But it does show in her books. How wonderful to read through all these essays by many different authors and get history, mythology, and the unique blending that is all Cast. Nyx is a real goddess, ancient and this book series has brought her back into human consciousness and belief. This book may confuse some. I enjoyed it and it gives the mythology, religion, and folklore of the House of Night series. It gives you more insight and depth that you will enjoy. If there's questions that you have had or things that you didn't understand then you should read this book, it might help to clear things up for you. I thought this was interesting. It talked about vampire folklore, myths, and religion and relates it to the House of Night series. The stories are amazing and each essay was well written and thought out. Good educational tidbit. It was pretty good and I enjoyed some of the background info. Some of it I found boring though. I did like the background on why she chose each name. It was a great book though and it was a good idea to explain everything to everyone. Fantastic reference book for those who enter the House of Night series Explanations, historical underpinnings, mythological references and more. Lovely artwork too. I could see this being required reading in a modern vampyre class. If you had a question in the HoN series, this book will definitely answer them! A must read companion book that’s nonfictional essays. This book was both interesting and yet boring. I did like the insight that others had to the world that is HON, but at the same time it seemed like people are/were reading too much into the book. If you are a big fan of this series I think you will enjoy this book, if you just read it for fun, this one would be ok to skip. “Fun fact: The planet Venus- aka, the 'morning star' when it appears before sunrise, outshining all the stars in the heavens-was once known as Luciferin.